"These recommendations are both timely and useful for creating a future of greener existing communities as well as that of greener future community growth." "Through such an introspective review, a community will be better equipped to refine its land use provisions to direct growth along a socially, economically, and environmentally desirable path…. 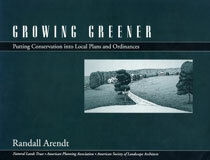 Growing Greener is an excellent reference for local planners."